Italian fashion, delicious food, magnificent architecture, and scenic beauty defines the Italian North. In this itinerary, indulge in lands that inspired some of the world’s greatest art-work, food and wine and fashion. An enticing journey in Northern Italy awaits! After breakfast, you will spend the day venturing around beautiful Florence, the “Cradle of Renaissance, where, with the help of Michelangelo, Italian art reached its pinnacle. Based on Etruscan-Roman origins, the city flourished in the Middle Ages as a free “Comune” and was further refined during the Renaissance. You will be fascinated by the uncountable monuments, churches and buildings as Santa Maria del Fiore, more commonly referred to as the Duomo. On your visit, you will be amazed by its magnificent dome built by Filippo Brunelleschi. After breakfast in Florence, departure to Bologna. There, you will discover the elegant city centre with its “porticos”, it’s shopping streets and so on. From Piazza Malpighi you will walk to Piazza del Nettuno and Piazza Maggiore (Neptune square and Major square) in the heart of the city, then King Renzo’s Palace; Palazzo Podestà and the Basilica of San Petronio, one of the biggest in the world. 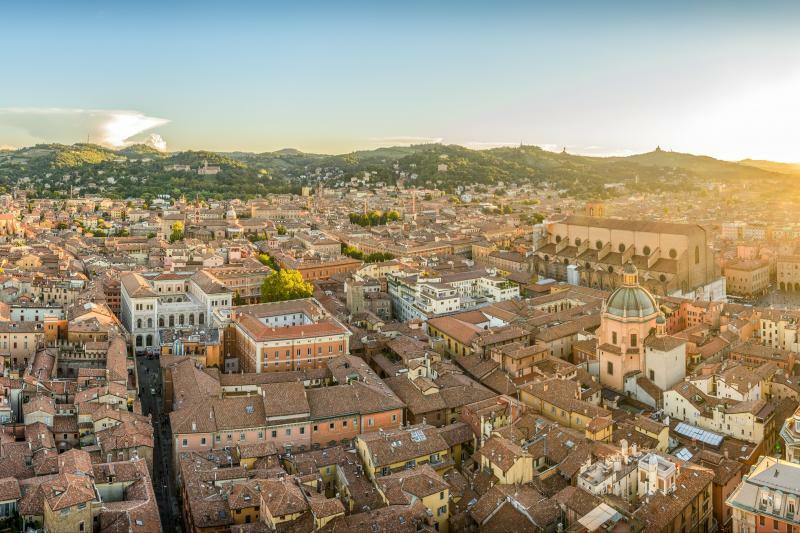 Bologna, it’s a real gourmet’s heaven…don't miss a tasty meal at your own leisure! In the afternoon, continue toward Padova, with Sant’Antonio Basilica: one of the most visited churches by pilgrims of the Catholic world. Later in the afternoon, arrival in Venice: the City of Love, one of the most romantic cities of the whole world and, undoubtedly the most beautiful city built by man! Check in at your hotel for dinner and overnight stay. Departure at 8:30 am from the Starhotels Ritz in Milan to the Lake Orta, a small and charming lake situated in the north-eastern side of the region Piedmont. Stop in the beautiful village of Orta San Giulio for a short visit. Then, tour by boat to reach the island of San Giulio, just in front of the village: it is known as “ the Pearl of the Lake”, almost entirely occupied by the Monastery Mater Ecclesiae, famous for studies on antique books. After a short visit, you will take the ferry back to Orta and then leave by bus to Stresa, on Lake Maggiore, one of the largest Italian lakes. Wedged between the pre-alps, and of clear glacial origin, it is framed in its lower section by the soft hills of the region of Novara and - in the upper section - by high mountain peaks with perpetual snows. These features make possible an average temperature during all seasons, milder in winter than in the inner areas and cooled down in summer by the breezes that blow on the water's surface changing the lake’s colour. Thanks to its mild climate, many species of flowers and plants typical to the sub-tropical climate could adapt to the lake areas climate. Enjoy breakfast at your hotel before setting off on a short visit of Como, a small town with amazing natural panoramas of mountains, Lake Como, and wild alpine valleys. You’ll also see the industrialized Brianzola hill, downtown Como, and the small houses in the village. The lake itself, sometimes called Lario, has long been famous for its y-shape, its three branches intersecting at Bellagio, that you will visit via boat. Separating the lake’s two southern arms with the alps dominating the horizon to the north, Bellagio is home to some of the most charming landscapes in Italy. Lake Garda, the largest lake in Italy, is the next destination. After breakfast at your hotel, you will have a panoramic tour of the lake’s west coast, taking in the splendid natural scenery: brilliant colours, the Dolomites of Brenta, and the gentle slopes of the moraine hills. Enjoy the area’s rich vegetation, including lemon trees, oleanders, magnolias, and bougainvillea that flourish thanks to the Mediterranean climate. So be sure to taste some of the olive oil and wines made locally. Next, you will move on to Sirmione, where you will see the lake Garda and its surroundings at their finest.